I am attempting to capture VHS into Edius 9 with ADVC 55. I have registered my VCR player as a preset device but can't capture. Before I explore any further could somebody tell me if Edius 9 should capture with ADVC 55? Thanks for prompt response Anton. My capture presets for VCR are accepted but no luck in capturing. to attach an image, click "go advanced" and select "manage attachments"
does you camera really record 8 channels audio? 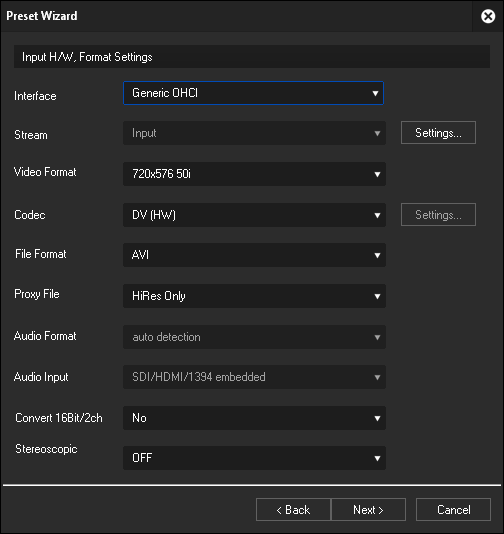 VHS is SD, not HD or HDV. The ADVC is an SD output device, via IEEE1394 (firewire), like a MiniDV camcorder. So you will need an SD preset. Later releases of Window generally need the legacy firewire drver. It is not automatically installed by Win8 or Win10. Thanks Antonsvideo (preset settings)and dpalomaki (legacy driver) for your help. I can now see video when capturing - but lots of problems. No audio when capturing - except now and then. Pressing STOP does not stop the capture and nothing registers in the bin - but on a few occasions it did. Even when I stop playback on my VCR nothing registers in the bin.